Update – This worked spectacularly well. To avoid the fog I hustled over to the Lawrence Hall of Science in Berkeley, where the life-sized whale provided a great backdrop for my photos. The sun shone bright at 1:02 p.m. (solar noon) and I got a reading of 37 degrees, within one degree of the actual latitude of 37.88 N.
If you missed the measurement today, you have another chance tomorrow at noon, since it’s reasonably close to the 1:00 am equinox. Try it out, let me know how it goes, and post results with #equinoon. Original Post: Tomorrow (Sept. 22) I’m going to measure a shadow at mid-day and find my latitude. This is a simple and cool experiment that I’ve wanted to do for years – I can’t believe I’ve let 95 equinoxes go by without doing this. You should do it too. The experiment is simple. 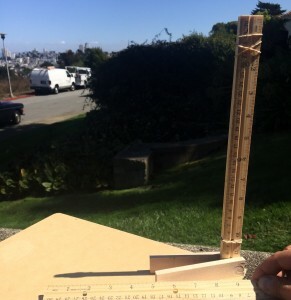 At mid-day tomorrow (solar noon, which is about 1:00 pm due to Daylight Saving but you can look up the exact time for your area) measure the shadow of a post, pole, or vertical object. Then measure the object itself. The angle formed by the pole and the imaginary line from the top of the pole to the end of the shadow will be equal to your latitude, the measure of your north-south position on the earth. You don’t even need to draw an imaginary line or use a protractor. Just use a triangle calculator on the web and enter the two known lengths (the pole and shadow) and the 90 degree angle of the pole with the ground, and the calculator will figure out the angle for you. Tomorrow is the equinox (actually it’s at 1:00 am on Wednesday so you could also do this on Wednesday) when the sun is over the equator so there’s no need to adjust for the Earth’s tilt. Just make sure that your post is vertical and the shadow is cast on something horizontal – the iphone’s compass app has a second page that acts as a carpenter’s level if you need to check. 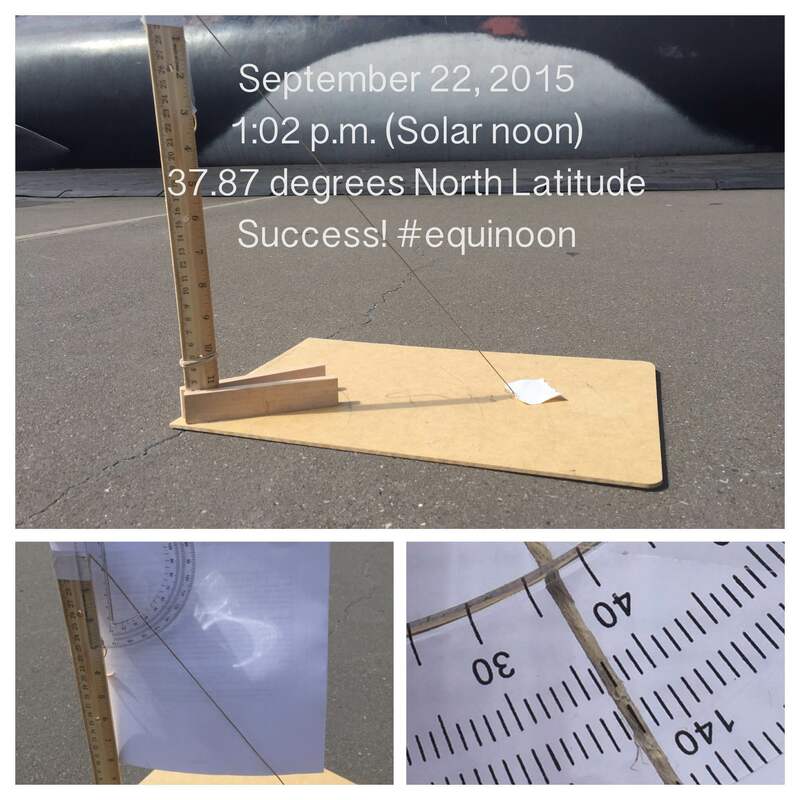 Be sure to post your results on the web and tag them with #equinoon. Let’s see how this goes and start homebrew science tradition!